Wow, what a week this has been! This time of year is always extra busy. On top of all the Christmas festivities, this week was also my last week of intense training before I start to taper for my first half marathon. Its hard to believe that in just 19 days I will be at Disney World running my first half marathon! So many exciting things happened this week. 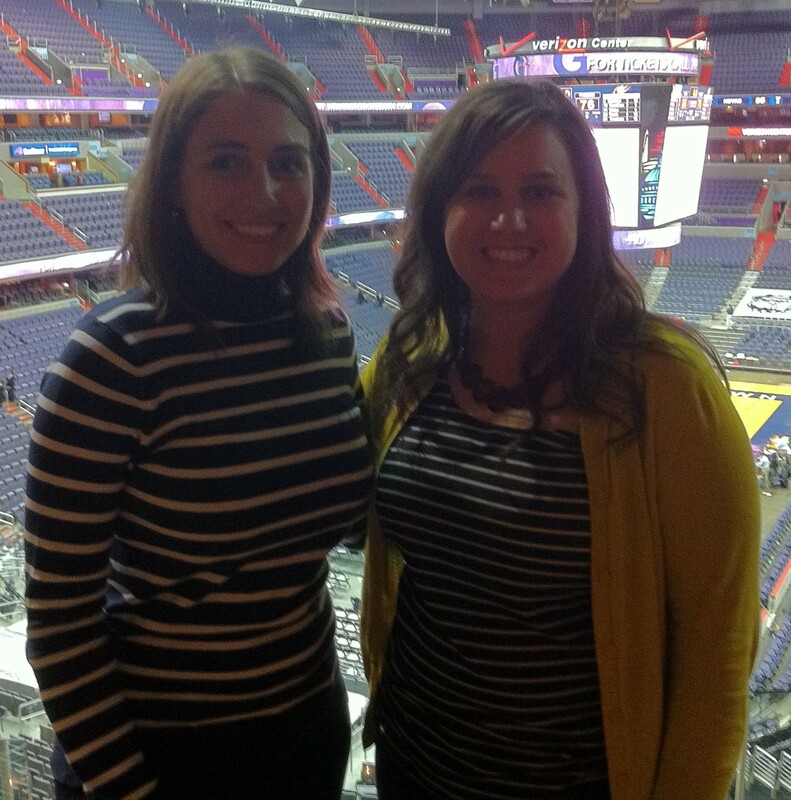 Preston and I were invited to spend Tuesday evening at the Georgetown vs. Elon basketball game in the Pepsi suite at the Verizon Center. I was scheduled to complete a 30 minute run on Tuesday, so after running errands after work I quickly jumped on the treadmill in order to ensure that I still got my run in. On Friday my department at school celebrated the holidays (and our extra long lunch/planning period that we were blessed to have thanks to an assembly and unusual bell schedule at school) with a pizza party. Preston and I left early Saturday morning for Illinois, and we’ll be here until Wednesday evening in order to spend Christmas with my family. Despite some nasty weather here in Illinois, we didn’t face any trouble getting here, which I’m very thankful for since when we were in Chicago for our connection we noticed that a lot of other flights were either significantly delayed or canceled altogether. This weekend I simulated my upcoming race weekend. With the Disney World 10k on Friday morning followed by the half marathon on Saturday, I opted to practice the weekend in its entirety. Despite being tired from an early flight on Saturday, Preston and I still ventured to the gym Saturday afternoon for a 6.2 mile walk. We ran yesterday afternoon, and for the first time ever I ran 13.1 miles! It was a very emotional experience. As I jumped off the treadmill belt at mile 13.1 I was flooded with emotion and started crying. I am beyond thankful that I had Preston running alongside me (he ran 14.5 miles yesterday), as there were times during my run that I felt so drained of energy that I didn’t know if I could finish my run. His encouragement most definitely helped me to complete all 13.1 miles, and I can’t wait to cross the finish line at Disney World with him in less than three weeks. 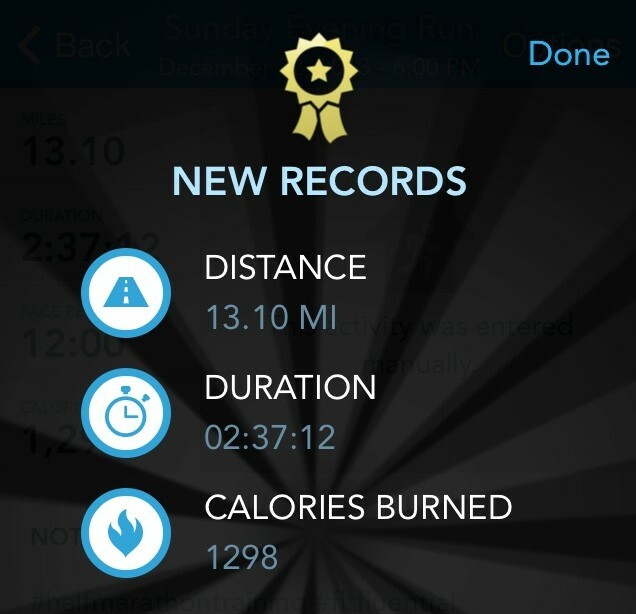 I did it – I ran 13.1 miles yesterday! And if my simulated race weekend weren’t enough worth celebrating, today I’m writing my 100th blog post! Who knew when I started this blog at the end of March that I’d write 100 posts in just under nine months! This blog has been such an incredible way to not only document my running journey but it has also fostered relationships with many other runners. I can’t wait to see where my running and blog continue to carry me to, not only in the coming weeks as I finish preparing for Disney World but also beyond my first half marathon! QOTD: Do you have any milestones that you’re celebrating this week? What are they? This entry was posted in Milestones, Training, WDW Half Marathon Training and tagged 10K, Disney World 10K, Disney World Half Marathon, first half marathon, foam rolling, half marathon, half marathon training, half marathon training plan, milestone, personal distance record, powerwalking, running, training, training plan, treadmill, walking, weekly recap, weight training. Bookmark the permalink.